I'm one of the guest designers over at Sweet 'n Sassy Stamps this month - here's the first card I've posted to their blog! One of the newly released stamp sets is called Peaceful Swans (it's also available as a digi set... but I love all the techniques that are possible with stamps...!). 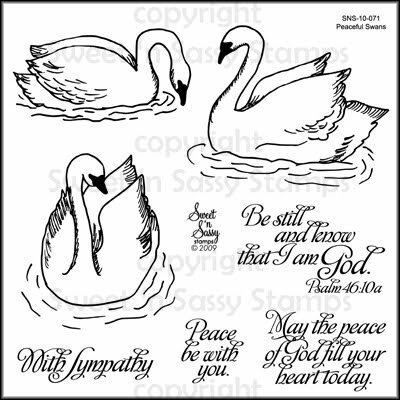 The set has 3 swan images and some beautiful sentiments. I love working with bird and animal images, and I love creating a scene around a focal image... One way you can achieve a reflected image is to stamp the swan image, ink up again and stamp the image onto a solid stamp, then use the solid stamp to stamp the image in reverse. **Make sure you mask the first stamped image so your second image doesn't overlap. I watercolored this image with reinkers and Inktense pencils using a water brush. The card base is embossed with a Fiskars texture plate. Make sure you hop over to the Sweet 'n Sassy blog to see the other creative work the design team members have done with these new sets! Wow, this week went fast! Dina this is beautiful (as usual). I love how you created the reflection of the Swan. Gorgeous. This card is drop dead gorgeous! You should do a tutorial on how you color your images (I think I put that in my last comment...LOL) Very elegant card. Thanks for sharing. I found you a Splitcoast. I really love your work. I'll be checking back regularly.